More Accelerated Christian Education schools, more misleading advertising. On the Advertising Standards Agency website today, an ‘informally resolved case’ is listed, related to Dewsbury Gospel Church trading as Branch Christian School. Branch Christian School uses the Accelerated Christian Education (ACE) curriculum. Rather than preparing its students for recognised exams like GCSEs and A Levels, it offers its graduates the International Certificate of Christian Education (ICCE). It will come as a surprise to no one to learn that I was the complainant in this case. It’s a similar story to the last time I pointed out that some ACE schools were misleading parents about the nature of their qualifications, but in this case, it’s more extreme. 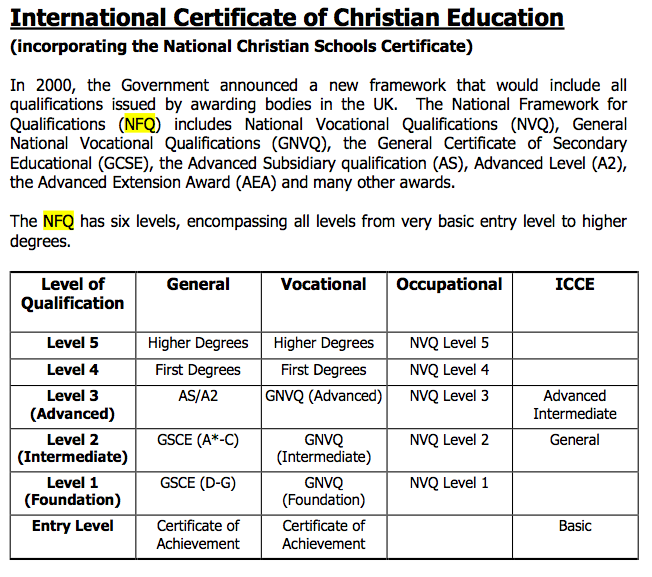 When I complained to the ASA about this in July, the Branch Christian School prospectus claimed that the ICCE was recognised by the Government’s National Framework for Qualifications (NFQ). There is no such thing as the NFQ. For those of you that don’t know, Reddit is a link-sharing site which kind of doubles as a forum. One of the most popular forumy aspects is the AMA (Ask Me Anything). Users post a title such as: “I lived next door to Ian McKellan for twenty years. AMA.” Other redditors then post their questions, and the original poster (OP) replies. OPs have to supply proof of their identity to the moderators. Reddit gets hundreds of thousands of hits per hour. The most popular posts make the front page, where they can be seen by millions. Obviously, this was about Accelerated Christian Education. The original poster turned out to be far from the star of the show, however. She didn’t seem to have any strong opinions; she merely thought her education was an interesting oddity. But other ACE survivors came out of the woodwork and it became packed with incredible stories. Interestingly, as I’ve found on this blog, there were very few people coming forward to defend ACE (admittedly, discussion on Reddit is dominated by liberals and atheists). You can obviously check out the entire AMA, but I’ll be posting highlights here over the next few weeks. I’ll start with probably the most heartbreaking conversation of all. One day. It’s still a little too fresh. As it is I am seriously regretting what I wrote. Save your prayers for me Christians. I don’t need them. What I want is you to leave me alone. So I’m not posting his username here with my quotes. Obviously, it would be extremely easy for you to find him and send him a message, but please respect his wishes. [ACE survivor]: I went to an ACE school K-12. I’ve spent the last 15 years learning on my own what I should have learned as a child. [Redditor]: My wife and I are in the same situation. ACE is NOT ACCEPTABLE PERIOD. It is a brainwashing tool to dumb kids down and teach them to be ignorant little Christians good for nothing except house wives and preacher boys. I’m 30 years old and I swear I still have nightmares from that school. The abuse those “teachers” (really just moms that didn’t want to be there) is unbelievable. I heard recently the school was being investigated by CFS but I don’t know if anything has come of it. This is part two of my serialisation of excerpts from Aram McLean’s forthcoming memoir. For all parts, see here. My ACE school moved a lot in the early years. The first place to accept it was a small church which also believed in a good Christian upbringing for every child. As such, they let us roll our rows of custom-made little kid offices into their back room. They also let us use their large cold basement for gym class, awards banquets, and other important recreations. After two years in their backroom, the little church wasn’t so happy about us anymore. Our principal, Mr Jordan, may have rubbed a few of the Elders the wrong way, but I couldn’t say for sure. Perhaps they simply got tired of the seeing children wandering about the corridors looking shell-shocked, like they’d just seen a holy ghost or something. The Doctrines of Grace had certainly become a hot topic of contention that second year as well. Serious rifts split down the middle of the little school and more than a few parents decided to take their kids out of it, by their own free will. Various locations around town followed as believers came together and then disagreed, and we carefully packed our plywood rows of offices around to each new place. We took over a farmhouse for a while, then a couple adjoining rooms in a motel, and finally the lower half of a family home. It helped that we weren’t a large school, and that turnover was high. My own life during this time often seemed to be a series of near misses, combined with more than a few direct hits. And right from the early days of the first church building’s little backroom, things didn’t feel too good. Today I am guest blogger at Bruce Gerencser’s The Way Forward blog. I’m writing about a subject that’s more important than Creationism or even a government agency validating a fundamentalist curriculum. It’s the fundamentalist doctrine of total depravity, and how it is used to justify horrific physical abuse. This will be the first of many posts on this subject. This view of the child as needing to be broken, like a horse, led to hideous abuses at my school. It was not only spanking. In drama classes, if a movement was painful, the teacher made students repeat it endlessly. A classmate recently emailed me to describe a time her sibling was made to snap his fingers until they were covered in blisters. In a choral verse class, children had to hold contorted positions on stage for 10 minutes or more at a time, and the teachers screamed at them if they were seen to move at all. “I was at [the ACE school] aged 3 – 7, and i cant remember what happened exactly when, but i got paddled a lot and remember having big red marks on my thighs from it and it hurt and was really terrifying! And straight after being paddled [the teacher] asked ‘do u believe that i love u?’ and i said ‘no’, cz obviously i knew that she hated me, and she said ‘YES I DO LOVE YOU!’ and it was just weird and confusing for a small child! and the things i remember getting paddled for were dragging my gym bag along the floor cz it was too heavy, and for drawing a cat on my pace, and for saying i havent had a biscuit when actually i had had a biscuit, which was a malicious lie!